Our range starts with the ST diverter valve which is a popular model for non-abrasive products in bakeries etc. The TSY is a heavier duty valve which has a heavy duty, thick polyurethane tongue seal housed in a recess out of the product flow giving the valve exceptional longevity. 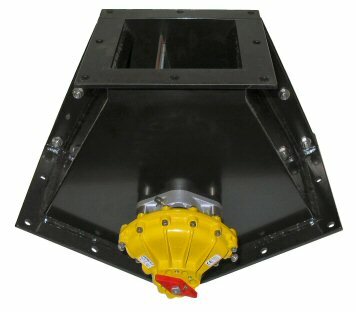 For gravity applications the GR heavy duty diverter (above) is very solidly built. Unlike other gravity diverters, this valve is fabricated from thick steel plate, not folded from gauge material. The vane has spring loaded, self compensating seals to ensure dust tightness. Of course we can also manufacture to specification- very large, very small or exotic materials are all pretty standard for us.